If you live or work in Apple Valley and want the highest quality care for your car, truck, or SUV, then visit Road Runner Auto Care. Since 1989 this family owned and operated company has been providing its customers with any type of automotive services they need. They offer automotive maintenance, oil changes, tires, and all types of repairs handled by experienced ASE certified technicians. Plus they use state-of-the-art technology to keep all makes and models of automobiles running at their best. Their level of customer service is second to none, and they even speak Spanish. Road Runner Auto Care is a one-stop-shop that the people in Apple Valley, California have depended on for over 25 years to keep their automobiles running smoothly. They do everything from performing electrical diagnoses and major overhauls to fuel injection system repair and mechanical restorations. There’s no job that’s too big or too small for these automotive specialists. Plus they offer car care tips, engine and transmission maintenance, and guidance in handling automotive emergencies. Whether you need a routine oil change, factory oil services, or information on synthetic or conventional oil to provide wear protection and prevent viscosity breakdown and deposit build-up, you need Road Runner Auto Care. If your vehicle has over 30,000 miles, take it to Road Runner Auto Care. They’ll flush out the burnt or oxidized transmission fluid, perform all necessary transmission services, and leave your transmission shifting smoothly. This will help prolong the life of your transmission. Having regular tune-ups performed is essential to keep your automobile performing efficiently. It also helps to maintain the power in your vehicle’s engine. When it’s time for a tune-up, take your foreign or domestic car, truck, or SUV to Road Runner Auto Care. 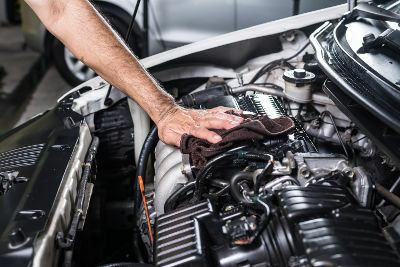 Their technicians will perform a complete tune-up service, do a visual inspection of all engine components, and install new parts if necessary. Don’t wait until your vehicle breaks down to visit. 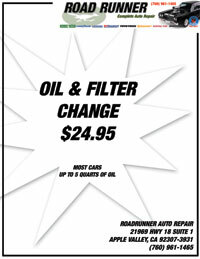 Contact the Road Runner Auto Care today and set up an appointment. They’ll thoroughly check and service your vehicle, perform an electrical diagnosis, identify current and potential problems, and take action to eliminate them immediately. They will tell you what services are recommended, how long it will take, and give you a firm price quote on what it will cost. If you live in or near Apple Valley, California, and love your automobile, contact Road Runner Auto Care. Here at Road Runner Auto Care, we can assist you with all your Apple Valley and Victorville area tire needs. From rotations to replacement, we do it all!